The Bottle Loft is an ultra-cool space saver for your refrigerator. Tired of not having enough room in the fridge? The Bottle Loft elevates beverages while providing additional space for food. Each hanging strip includes 3 strong neodymium magnets, powerful enough to hold beer, soda, cans, bottles, basically anything with a metal lid. Simply peel off the adhesive backing and stick the Bottle Loft to the ceiling of the fridge. 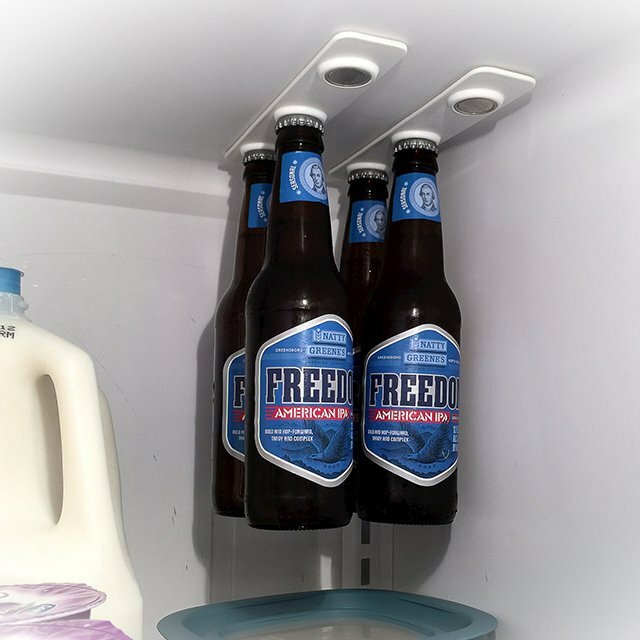 Each purchase includes 2 Bottle Loft strips, just enough to hang your favorite six pack of beer or soda. These are great for parties! Avoid coolers and easily stock your freed-up fridge with a variety of food and beverages. The super strong 3m VHB adhesive and the high strength neodymium magnets allow Bottle Loft to hold over 3X the weight of a typical 12oz bottle by it's cap alone. Each Bottle Lift measures 8 inches by 1.5 inches by 0.2 inches and weighs 6.4 ounces.